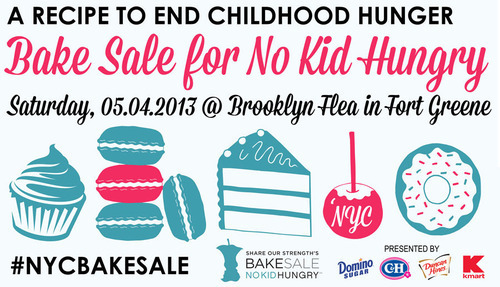 Each Spring, a team of NYC food bloggers and bakers get together to bake a difference for No Kid Hungry. Help end childhood hunger by joining our team at the Brooklyn Flea in Fort Greene! Proceeds will benefit No Kid Hungry, the national nonprofit organization working to end childhood hunger in the U.S. by 2015. Take the No Kid Hungry pledge - it’s free! Invite all of your Facebook friends to the bake sale! Come down to the Brooklyn Flea on Saturday, May 4th and buy lots of brownies, blondies, cupcakes, cookies, and a whole lot more - there will even be some gluten-free goodies! Donate online if you can’t make it to the bake sale. Help us reach our $3,000 goal! Enter one of our sponsored raffles (with a donation of $10 or more)! Whichever way you decide to get involved, we truly appreciate your support! Have questions? Leave them in the comments below or email Lillian at NYCbakesale @ gmail.com. Thanks!